The rear range light was built in 1876 to replace the original 1841 light that had fallen into a state of disrepair. The 55-foot brick tower is built into the keepers quarters and painted white. For the next 84 years the light guided vessels from Saginaw Bay in Lake Huron to the entrance of the Saginaw River. Range lights were built in pairs to allow ships to align themselves with the center of a channel. When the two lights were in line a ships crew knew they were safely in the center of the channel. The light was deactivated in 1960 and abandoned by the U.S. Coast Guard in 1980. The building was left to deteriorate at the hands of vandals. In 1989 the Dow Chemical Company bought the light and is working with the Saginaw River Marine Historical Society to restore the structure. With financial support from Dow and Society members, the group hopes to restore the light to its 1950 appearance and operate it as a maritime museum. If you would like more information on how to become involved in the restoration efforts please mail the address below with your contact information. Interior of building during restoration work. - Stephen Hause. 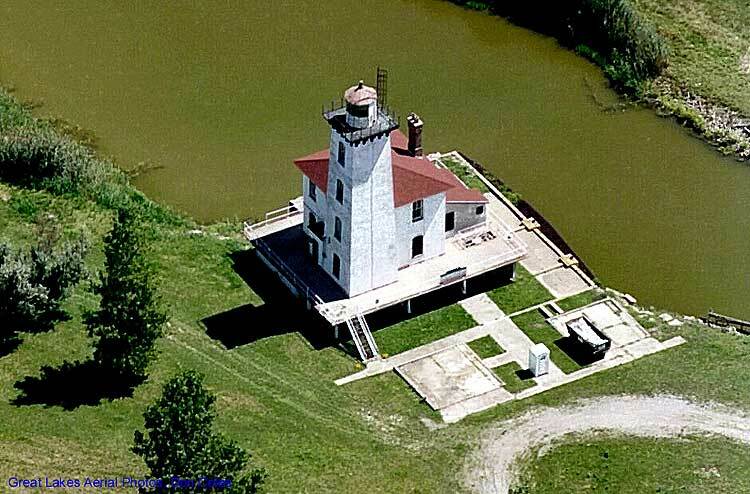 Located on private property the light is only accessible for photographs by boat. The light is open to society members for scheduled restoration sessions.